I remember when I was in the two week wait to find out if our first DE cycle worked, it by far, felt like the longest TWW I had ever been through because this one just HAD to work. This one was different in so many ways and after 6 previous failed cycles it was very hard to feel hopeful that the outcome would be any different than any others. When those 11 agonizing days were finally over and I found out I was pregnant, I couldn't believe it. It was one of the best days of my life. In the throes of infertility, time went SO SLOW and I always felt like we were waiting on something, waiting for a period, waiting for results, waiting for appointments, waiting for months to pass to start a cycle; and now here I am wishing that time would feel as slow as it did in those days. Today, I get to say that I have a 6 month old baby. Half of a YEAR has passed since her birth, which to me feels like it was just a few weeks ago. What they say is true, you blink and the time has just passed. Luke Bryan has it right, sixty seconds now feels more like thirty, tick-tock, won't stop, around it goes, sand through the glass sure falls in hurry, all you keep trying to do is slow it down, soak it in, keep trying to make the good times last as long as you can, but you can't, it just goes too fast. 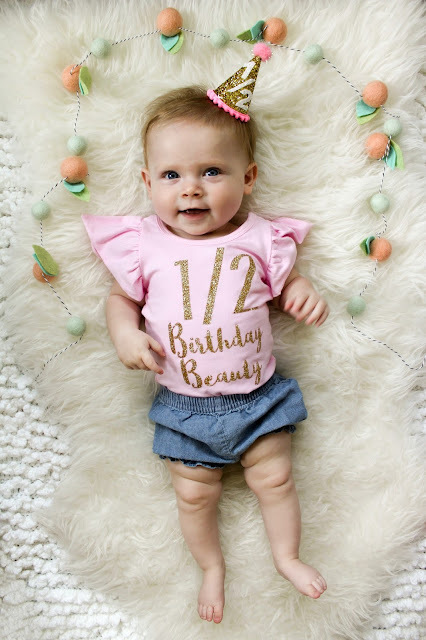 Maybe those sentiments seem a little dramatic or emotional for a baby who is only 6 months old but for some reason, her half birthday is hitting me like my 25th, hard! And don't ask why it was my 25th of all birthdays I had such a hard time with, and to make matters worse my mom got me an "Over the Hill" balloon. Ok so enough about time going too fast and me being overly emotional about my baby. Let's get on with the fun part—all about Georgia! This little wildflower is exactly that, she's happy and free, she loves to chat up a storm and is so unbelievably curious about everything these days. Every day I think of the movie Elf because the quote "smiling is my favorite" is what always pops in my head when I look at her. She seriously smiles at everyone and everything. She's the happiest baby on the block most of the time. Although she is such a cheerful little darling, she also has FOMO (fear of missing out) bad like so many other girls I know, and this one is no different. If anything of slight interest is going on around her, she has to be awake and participating and included. She'll be rubbing her eyes and whining up a storm, but she will be damned if she is going to take a nap while any hoopla is going on while she is there. She's a social butterfly and I think it has a lot to do with us bringing us her pretty much everywhere with us. As far as official stats, I don't have those yet because her doctor's appointment isn't until next Tuesday but I'm guessing she is roughly 16 pounds and probably 25-26" long. She's a long thing and has a big head! She doesn’t sleep through the night, I only get that luxury once in a blue moon, but I don't mind. She wakes up 1 or 2 times to nurse still, this girl loves to eat. We still have her in her bassinet but are transitioning her to a Pack & Play next. She is still nursing/eating every 2-2.5 hours and we have just recently started her on some purees. She is also sitting pretty well unassisted so we will be starting Baby Led Weaning soon which I cannot wait for. So far she has had peas, sweet potatoes, and squash purees as well as beef broth. She has also had some chunks of melon, peach, and orange. Movement-wise she can roll from tummy to back really well. She's still working on back to tummy, that arm is still a challenge for her. She can sit unassisted pretty well & LOVES to stand. She prefers standing to anything, I swear this girl is going to just skip crawling all together. Her new favorite thing is to grab at faces and hair, especially beards. She also is obsessed with the dog and cat. She watches every move they make and she loves to pet them and our cat, who does not give AF, seems to be tolerating her really well which is good. Georgia also loves bath time, her activity gym, and exersaucer, diaper changes, looking in the mirror, rolling around on her floor, playing with books, putting her own pacifier in her mouth, screaming, and blowing raspberries. She dislikes when she is hungry and being left out. That's about it! She is seriously an absolute joy to be around and can light up a room and put a smile on the face of anyone she comes into contact with. Being her mama has been so rewarding and I love every second that I get to spend with her. I miss her all day long at work and I cannot wait to see her at the end of my day. Being a working mom, the days and times that I do have to be with her are even more precious and I try to soak up every second that I can with her which is why we love to take her with us wherever we go! For Labor Day weekend Joe and I are taking her to St. Louis with us and staying overnight and going to the zoo. I've been dying to take her to the zoo and I've heard amazing things about the STL zoo, and bonus, it's FREE. I cannot wait. Happiest of half-birthdays to my little peach. You prove to us time and time again, every single day that our journey to you was worth it all. We love you! She is so beautiful. Happy half birthday Georgia June. She is so precious :) Happy half birthday to Georgia! She's the sweetest & most adorable little peach! I am so happy for you, Mama! What an exciting milestone, so happy you are celebrating. Time is such a fickle little thing! Especially as a parent! Happy half birthday Georgia!!! Enjoy the zoo, it's by far one of my favorite activities with my kids! We live in St. Louis if you have any questions on things to do/see! She's darling! How cute is she???? How crazy that six months can fly by so fast!